I gave Chloe a big task, create some wonderful cakes for my wedding, that were lilac and white. ...She went above and beyond... Her cakes were light, fluffy and so very tasty. If I’m totally honest I didn’t want to share them because I wanted them all to myself. She also created some magical snowflakes and stars and sprinkled glitter dusting all over. They looked incredible and I will be wanting her to make a cake for me at any given opportunity. Gluten Free Sugar Cookie Wedding Favours. 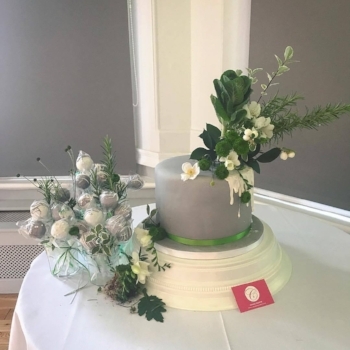 We couldn’t have imagined so splendid a centrepiece for our wedding, you are an artist, and we’re proud to have had your cake on our wedding day. Not only was it the best looking cake any of our guests had ever seen, it was impossibly delicious too. I just wanted to drop you a little note to thank you for the MOST DELICIOUS CAKE EVER. I literally shoved every slice I could find into my mouth as soon as it came out. You are a cake wizard and it meant so much that someone we knew had made it for us. You can check out even more bakes on my Facebook, Twitter & Instagram profiles!